Does either of these statements describe your organization? A. Content is everyone’s responsibility – but it’s no one’s job. B. Content marketing is treated as a project, not a process integrated into every function of the organization. If you picked A or B, keep reading – help is on the way. In reality, content marketing should be a component of your existing marketing strategy, not a separate entity. It requires the involvement of leaders who can set goals, make decisions, and be accountable for successes (and failures). One of CMI’s goals is to help organizations transform their marketing operations – from a subservient function that merely describes the value of a product or service into an enterprise-wide presence that capitalizes on the benefits of content-based engagement. But, to do this, you need to move beyond viewing content marketing as an on-demand service to support sales and start thinking of content marketing in terms of how it can truly impact the business. To help you in this transformation, we created a new workbook, Launch Your Own Content Marketing Program. In it, we take you through a series of easy-to-complete, practical exercises that will help you establish content marketing as a logical extension of your brand’s core values and build the foundation for a distinctive, engaging, and scalable content marketing program. First, you need to discover the purpose that will drive your strategy – the business reasons for creating content. One easy starting point is your business’ sales funnel. Identify the level where your team struggles the most to reach its goals. Does your brand need to gain awareness in the marketplace? Is it difficult to distinguish your business from your competition? Do you get lots of leads but have trouble closing the deal? 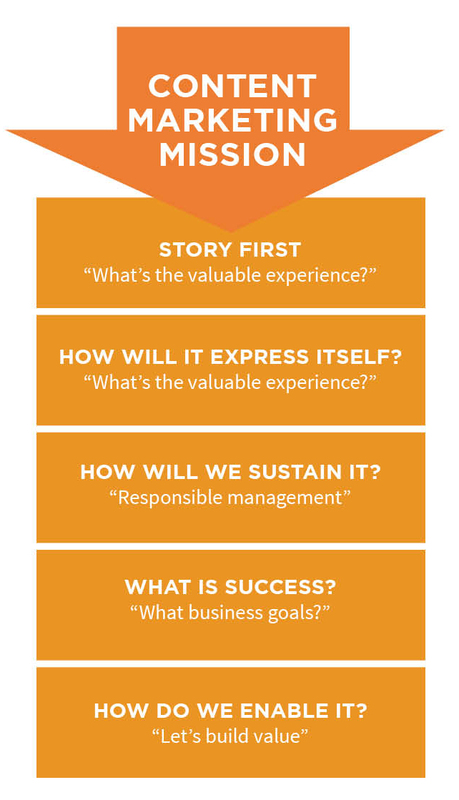 Use the newly identified pain point to inform the creation of your content marketing mission – a statement that outlines your company’s reason for creating content, including the values, priorities, and perspectives the content will uphold. Core audience target: What type of person can you help most with your content? Content product: What will be delivered to the audience? What types of information will you provide? Desired outcome: What benefits will members of your audience realize once they consume your content? Keep in mind that not every consideration needs to be explicitly stated in your mission. The CMI mission outlines our target audience (enterprise marketing professionals) and the content products we provide (live events, blog posts, research, etc.). It does not mention the desired outcome for our audience. However, our primary goal – advancing the conversation around content marketing – is implied by the education and insight we offer through our content. Another exercise in the workbook gets you started in building a platform for content that forges an emotional connection with your audience. Start with a topic you want to discuss or perhaps one your competitions uses. Ask yourself why this topic might be important to your target audience. Write down your answer. Take that answer and ask why it matters to your audience. Repeat this evolutionary process until you have asked and answered why five times. Why is our product important to CIOs? Because our modularized data centers are less expensive and more agile than traditional data centers. Why is it important for CIOs to have less expensive and more agile data centers? Because business computing needs are rising exponentially, yet CIOs still need to manage their costs. Why is it important for CIOs to know about ways to manage costs while increasing their computing power? Because if they stay current with these trends, then they can expand the business more quickly and gain a competitive advantage. Why is it important for CIOs to understand how future trends can give their business a competitive advantage? Because if they aren’t able to stay ahead of the curve, their company may go out of business or they may be out of a job. Why is it important to CIOs to stay ahead of the curve, to keep their business open, and keep their job? Because their livelihoods depend on having this knowledge. We believe in the office of the CIO, but things are changing fast. For CIOs to stay competitive and stay in business, they must stay ahead of the curve. They can do this by capitalizing on future trends that will help them expand their business and create a competitive advantage. Specifically, business-computing needs are rising exponentially, and CIOs must keep up with ways to do things faster, and less expensively. Modularized, containerized data centers – and the trends and best practices in deploying them – represent a powerful means of helping CIOs gain efficiencies that can give them an edge over their competition. With better-detailed content marketing programs, content marketers are increasingly recognizing that they need to lean in, step up, and function as a strategic partner that can help their business predict and adapt to new disruptions. These two exercises only scratch the surface of what’s possible to achieve with the workbook. Don’t let a lack of confidence in your content marketing capabilities hold you back from achieving success. 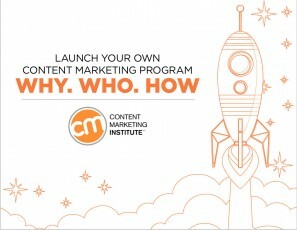 Take a giant leap for brand-kind, and download the complete workbook, Launch Your Own Content Marketing Program. Does your team need to tackle a content marketing initiative, but lack the internal expertise to make it happen? CMI can help. Our Online Training & Certification Program provides you with must-know strategies, tactics, and best practices you can use to build a strong foundation for your projects. Learn more.